The Hyatt House Pittsburgh Bloomfield Shadyside hotel is conveniently located to Downtown Pittsburgh and just minutes away from Oakland, home to University of Pittsburgh and Carnegie Mellon University. With neighboring hospitals UPMC Shadyside and UPMC Hillman Cancer Center, this hotel in Pittsburgh is just a short walk or shuttle ride from everything you need. Enjoy some of Pittsburgh's prime shopping and dining experiences in the Bloomfield and Shadyside neighborhoods. 28APR17-30APR17 Univ of Pittsburgh Graduation-Nonrefundable full prepayment due at booking, no changes or cancels. The Hyatt House Pittsburgh Bloomfield Shadyside hotel is conveniently located to Downtown Pittsburgh and just minutes away from Oakland, home to University of Pittsburgh and Carnegie Mellon University. 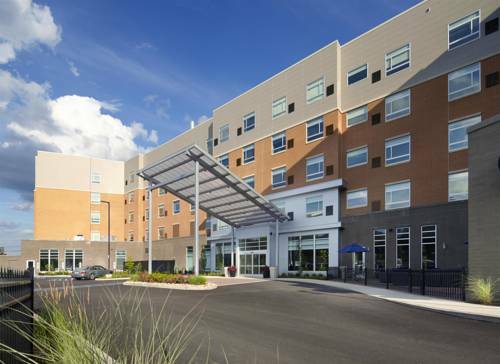 With neighboring hospitals UPMC Shadyside and UPMC Hillman Cancer Center, this hotel in Pittsburgh is just a short walk or shuttle ride from everything you need. Enjoy some of Pittsburgh's prime shopping and dining experiences in the Bloomfield and Shadyside neighborhoods. Credit card required at booking to guarantee room. 28APR17-30APR17 Univ of Pittsburgh Graduation - nonrefundable full prepayment due at booking. No changes or cancels allowed. Cancel by 3 PM local hotel time 24 hours prior to the day of arrival. 28APR17-30APR17 Univ of Pittsburgh Graduation - nonrefundable full prepayment due at booking. No changes or cancels allowed.